Breakfast at the hotel and drive to Nawalgarh. On arrival at Nawalgarh check-in at hotel. Afternoon city tour of Nawalgarh visiting Havelis & Forts. Overnight stay at hotel.Nawalgarh: Founded in the 18th Century by Nawal Singh, it has some of the finest frescoes in the Shekhawati region. A huge fort with colourful bazaar and numerous havelis with elaborate architecture make it an interesting destination for a 1 day / 1 night stay. There are a few prominent havelis like Anandilal Poddar Haveli, Aath Haveli, Hodh Raj Patodia Haveli etc., which are to be visited, and so are the two forts and the palace hotel Roop Niwas that is a beautiful heritage property and is renovated with modern facilities. The Palace offers spacious painted rooms, Luxurious interiors, graceful hospitality and great thematic evenings with sumptuous cuisine. The registered painting in their Art Gallery is a treat to the visuals. After breakfast drive to Mandawa. On arrival at Mandawa check-in at hotel. Afternoon take a walking sightseeing tour of Mandawa Village. Overnight stay at hotel.In the heart of the Shekhawati region of Rajasthan lies the beautiful small town of Mandawa, popular throughout the state for its forts and havelis. This town is situated in the north Indian state of Rajasthan around 190 km away from Jaipur, the capital of Rajasthan.The fort town of Mandawa is well connected with the other places of the region through a good network of roads. Like most of the other places in north India, Mandawa too has extreme climatic conditions. The summers can be very hot with the mercury touching 40.5°C, whereas winters can be chilly and the temperature can fall below 10°C. The best season to visit this place is winter i.e. October to March. The compact and busy little market town of Mandawa was settled and fortified in 18th century by the dominant merchant families of the region. 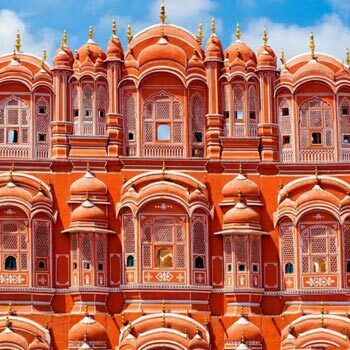 Though with time these architectural extravaganzas faced ignorance, their attraction did not fade away and today also these are some of the major attractions for the tourists visiting Rajasthan. Morning, sightseeing tour of Jaisalmer. It is in the heart of the Great Indian Desert. Its temple, fort and palaces are all built of yellow stone. The city is a mass of intricately carved buildings, facades and elaborate balconies. See the Patwon-Ki-Havelis, Salim-Singh-Ki-Haveli and Gandhi Sagar Tank. Late afternoon visit the Sand Dunes and a camel ride to view the sunset, as the sky is set on fire and Rajasthani folk musicians play haunting tunes. It can be an unforgettable experience. Dinner at Hotel Himmatgarh with the lit up Jaisalmer fortress. Overnight at the hotel. Jaisalmer – JodhpurAfter breakfast drive to Jodhpur, On arrival check-in at hotel. Afternoon free for leisure activities. Overnight at the hotel. Breakfast at the hotel and proceed for city tour of Jodhpur visit Mehrangarh Fort, The Jaswant Thada and Ummaid Bhawan Palace. Later continue drive to Rohet Garh, situated 40 kms away from Jodhpur. On arrival at Rohet check-in at hotel. Overnight stay at hotel. Rohet is also known as 'Evergreen Oasis in the Desert'. Rohetgarh Fort in this village used to be the ancestral home of Thakur Dalpat Singh I and care by the family into one of the finest Heritage hotels in the country. Overnight stay at Rohetgarh Fort. Breakfast at the hotel and drive to Udaipur. On arrival at Udaipur check-in at hotel. Overnight stay at hotel.Udaipur is situated 1900 feet above the sea level in the Aravalli Hills. This beautiful city was founded by Maharaja Udai Singh in 1559 AD and is named after him. One of the most romantic cities in Rajasthan, Udaipur is also known as the city of lakes. The marble palaces, beautifully laid out gardens and the lakes make Udaipur seem almost like a mirage in the desert. Breakfast at the hotel and drive to Jaipur. On arrival at Jaipur check-in at hotel. Evening free for self-activities. Overnight stay at hotel.Jaipur: Capital of Rajasthan, Jaipur, was founded by Maharaja Sawai Jai Singh in 1728 A.D. 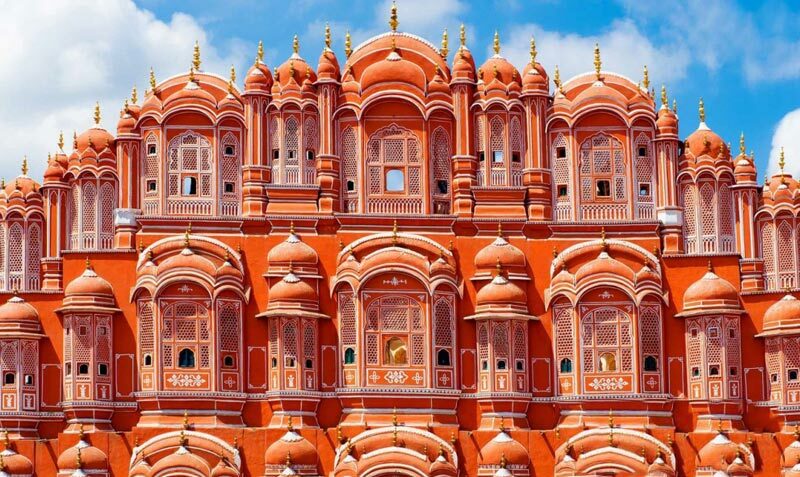 It is also called Pink City because most houses in this city are pink coloured. The city is surrounded by thick walls 20 feet high and 9 feet wide having eight gates. Ajmeri gate and the Sanganeri gate in the south, Chandpole gate in the west and the Ghat Darwaza in the east are some of the main gates of Jaipur. The city is surrounded by hills on all sides except the southwest. Forts and temples can be seen on the hills. Breakfast at the hotel and drive to Agra, en-route visit Fatehpur Sikri. Fatehpur Sikri was built during 1571 and 1585. Fatehpur Sikri is one of the finest examples of Mughal architectural splendour at its height. Later continue drive to Agra. On arrival at Agra check-in at hotel. Evening visit the famous Taj Mahal. Overnight stay at hotel.Taj Mahal built by Mughal Emperor Shah Jahan as a memorial to his queen Mumtaz Mahal, made out of white marble took 22 years to complete (1630-1652 AD).